Psoriatic arthritis (PsA) is an inflammatory condition caused when a person’s own immune cells attacks their joints. 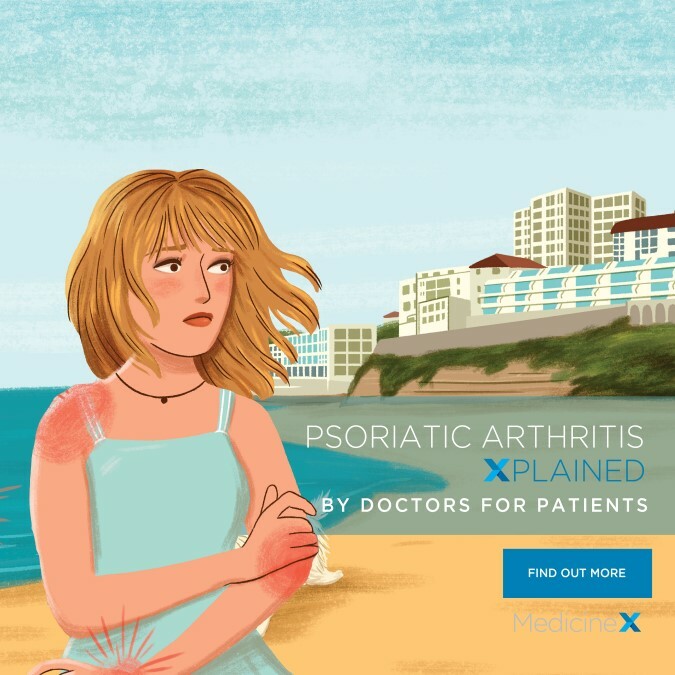 It develops in some people with the skin condition psoriasis, and typically causes affected joints to become inflamed (swollen), painful and stiff. PsA affects one to two in 1000 people in the general population and up to 30% of people with psoriasis will develop the condition. In most cases, the psoriasis develops before the arthritis, sometimes by years. PsA most often develops between the ages of 30 to 50. Around one in three people who have psoriasis and not PsA will also have pain and stiffness in their neck or back. PsA can take many forms and it can affect almost any joint in the body, including the joints of the spine and the neck. The inflammation begins around the edges of the joints and, if left untreated, it can lead to swelling in the joints and permanent damage to bone and cartilage. The longer inflammation lasts in a joint, the greater the risk of damage. For this reason it is important to seek a diagnosis as early as possible so that treatment can be given before damage occurs. In the early stages of disease, inflammation causes pain, stiffness, and swelling in and around the joints. PsA may affect the spine, hands, shoulders, elbows, feet, knees, or ankles. In hands and feet, PsA often affects the joints closest to the nail in the fingers or toes. PsA can develop slowly with mild symptoms. On the other hand, it can develop quickly and become serious. This is why early recognition, diagnosis and treatment of psoriatic arthritis is essential. This early effort can help prevent or limit joint damage. In 60-80% of people with PsA, psoriasis occurs before joint disease. If you have been diagnosed with psoriasis, it is important to tell your doctor or skin specialist immediately if you have any aches and pains. The severity of either condition – psoriasis or PsA – does not relate to the other. You might have psoriasis with only a few skin lesions, but with many joints affected by the arthritis. The other is also true; you might have psoriatic arthritis but never develop the skin condition. The most commonly used example is prednisone. These drugs suppress the immune system and shut down the inflammatory process. Steroids are generally used to bring the disease under control while waiting for other treatments to take effect. Steroids are used usually as short courses because of the risk of side effects from long-term use. DMARDs including methotrexate, sulfasalazine and leflunomide can be used to reduce symptoms of inflammation, and can slow down disease progression and risk of damage in the long term. They are particularly effective if taken soon after your symptoms first appear. Biologic medicines are used when other medications have been tried but severe symptoms are still present. Medicines like Enbrel are made from human proteins that get right to the source of the problem. Enbrel catches onto and restrains another protein already in your body called tumour necrosis factor (TNF), which is a naturally occurring chemical messenger in your bloodstream. Too much TNF often plays a part in causing the painful swelling and redness around your joints in rheumatological conditions. Enbrel works by blocking the effects of too much TNF, which means that it cannot start the process that leads to inflammation. Surgery may be needed when pain is severe or when deformities are disabling. For example, deformed joints in the feet may make it painful and difficult to walk, while deformities in the hands may make everyday tasks difficult. Some people find meditation, acupuncture and other natural therapies helpful in managing symptoms. These treatments are generally safe when taken alongside conventional treatments, but you should discuss this with your doctor. There is no evidence that these therapies provide any long-term benefits so it is usually best to combine them with medical treatments. Exercise can strengthen your muscles, protect your joints and keep your joints flexible. Your physiotherapist will be able to recommend suitable exercises. An occupational therapist can show you ways of doing tasks that will keep you independent. Moderate your alcohol consumption; your doctor, rheumatologist or skin specialist can tell you how much is safe for you. PsA doesn’t mean you can’t get on with your life. Arthritis New Zealand has helped thousands of people do just that.